Kuklin walked two tightropes in writing this book, doing so with competence and skill. Her first tour de force was to succeed in writing about people, not politics, even though the latter plays a consequential, even a central, role in the lives of those she writes about, in the form of immigration policies. Kuklin's mastery is also manifest in her ability to engender empathy and compassion without writing a tear-jerker; the painful experiences, often narrated in a raw and unembellished manner, while inspiring, are more conducive to a productive conversation on the complicated issues of immigration. A must-read. Readers will see how immigration organizations are structured and, prior to the ’90s, how open U.S. borders were. In their accounts, these teens discuss how they are processing DACA’s uncertainty and how they identify with being American (or not). A time line on immigration policies and laws and helpful chapter notes are appended. A thought-provoking read on immigration in America. 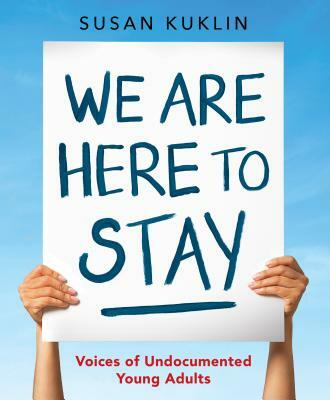 Susan Kuklin set out to give voice to the silent in We Are Here to Stay...Kuklin transcribes the stories as spoken by their owners, which serves to bolster their authenticity and the humanity. Their powerful narratives reinforce one immigrant's words: "Being undocumented doesn't define me. I don't want documents... to be my signifier. Ultimately, I'm just a person." And the missing images speak volumes about the way society views these youths. Chilling, inspiring and hopeful, We Are Here to Stay transcends politics and finds the common bonds of mankind. These empty pages are haunting, emphasizing the fear that the children live with, even as their stories address the importance of bringing their experiences out of hiding...We Are Here to Stay is an important book for anyone concerned about the issues surrounding undocumented immigrants.